The Rock & Roll Hall of Fame held their Eighteenth Annual Induction Dinner in the Grand Ballroom of the Waldorf Astoria Hotel. It is always a great evening as some of the world’s biggest music stars come to honor their heroes. This year the event was tempered by the recent loss of Clash founder Joe Strummer, but for all the attendants, including ACDC, the Police, Elvis Costello and the Attractions, The Righteous Brothers, record exec Mo Ostin, sidemen Benny Benjamin, Floyd Cramer, Steve Douglas and members of the Clash – it was a night to remember! 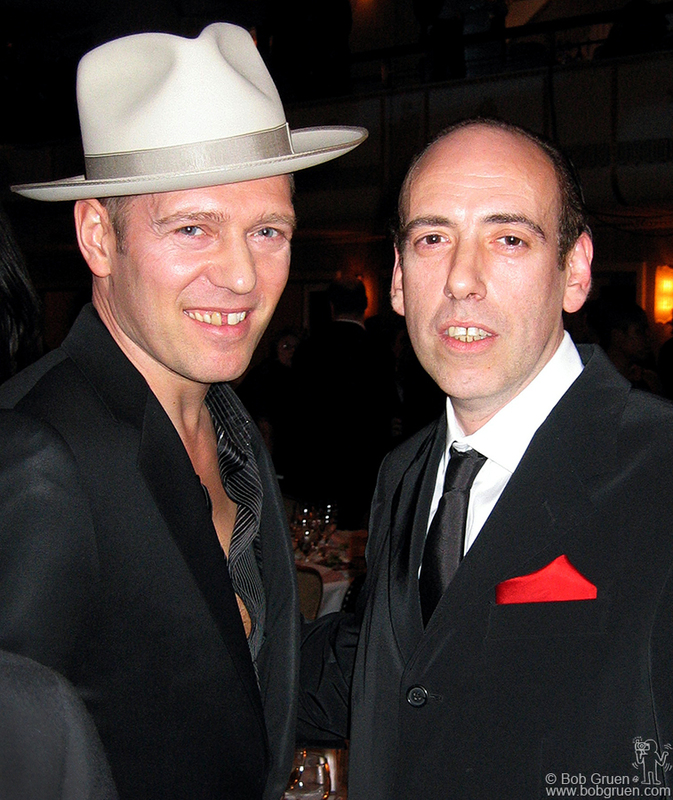 Paul Simonon and Mick Jones arrive at the Dinner. 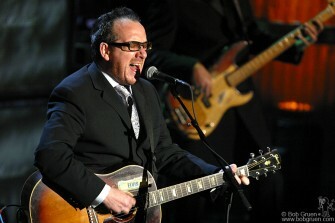 Elvis Costello, being inducted into the Hall of Fame with his first band The Attractions, arrives at the dinner with his new attraction, the lovely singer Diana Krall. Sir Elton John looks happy as he arrives at the Waldorf. 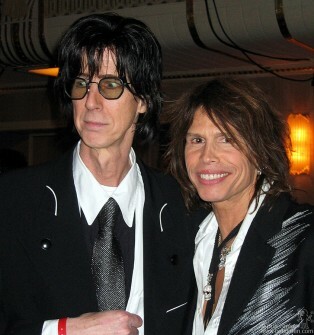 Ric Ocasek and Steven Tyler check out the room as the dinner begins. 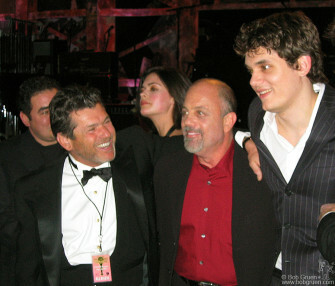 Rolling Stone Magazine publisher and one of the founders of the R&R Hall of Fame Jann Wenner greets Billy Joel and John Mayer. Mick Jones says hello to tall actor Tim Robbins. 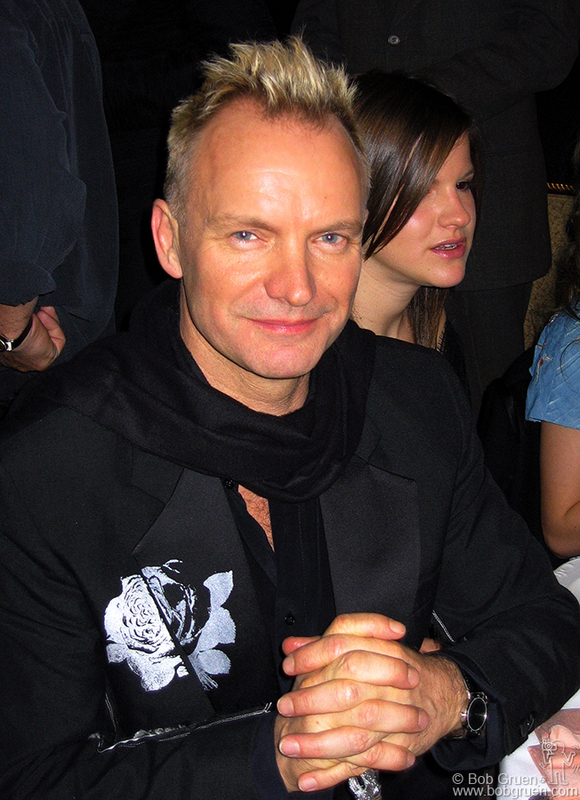 Sting smiles as he is about to be inducted with his band, the Police. 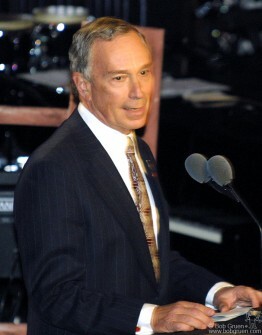 New York’s Mayor Mike Bloomberg welcomed the festive crowd saying “New York Rocks!”. 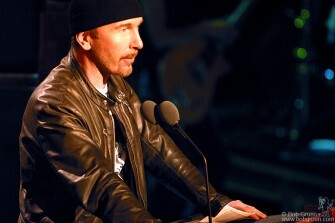 He said the Police song “Every Breath You Take” inspired the city’s new antismoking laws. 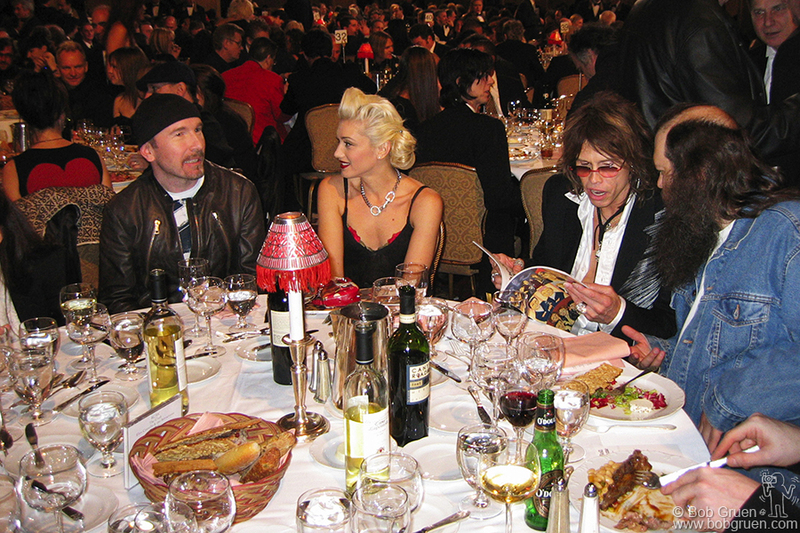 U2’s The Edge chats with Gwen Stefani while Steven Tyler checks out the program book with producer Rick Rubin. 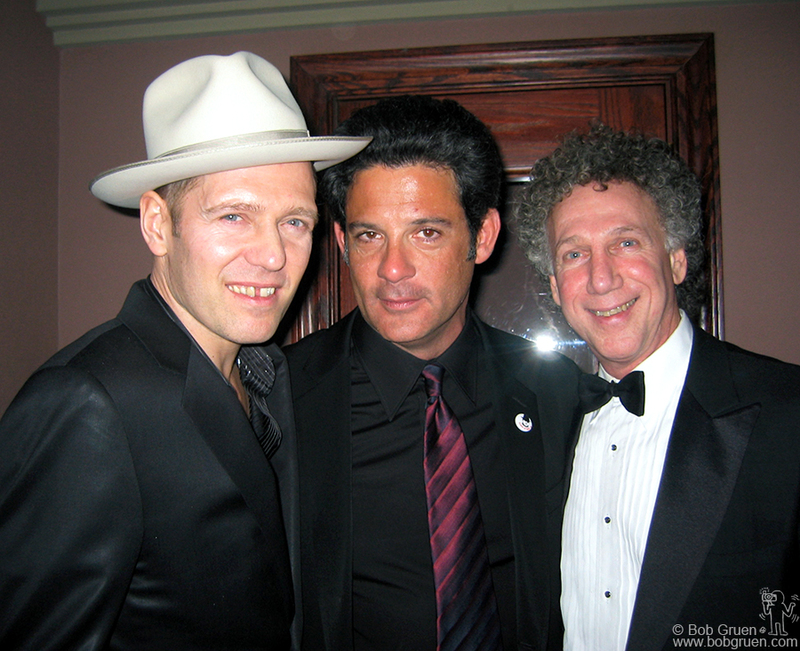 Elvis says hi to Lucinda Strummer as Joe’s daughters Lola and Jazz look at the photos in the program. 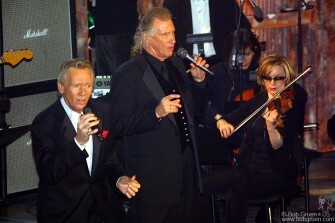 Billy Joel inducted the Righteous Brothers, Bill Medley and Bobby Hartfield, who then sang their hit “You’ve Lost That Lovin’ Feeling”. 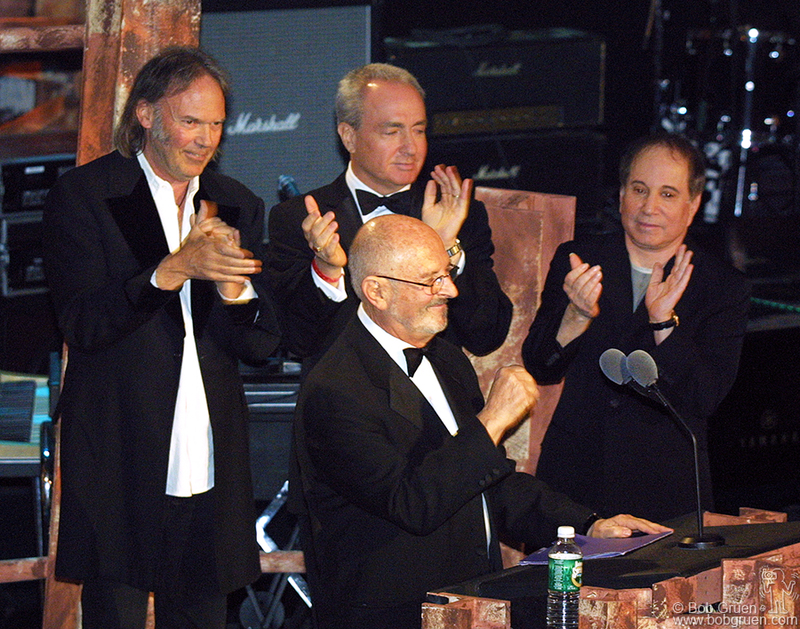 Neil Young, Lorne Michaels, and Paul Simon inducted Warner Record’s Mo Ostin who developed the careers of many of the Hall of Fame’s members. Neil said he felt the country was like a “gas guzzlin’ SUV speeding down the road and the driver is drunk”. 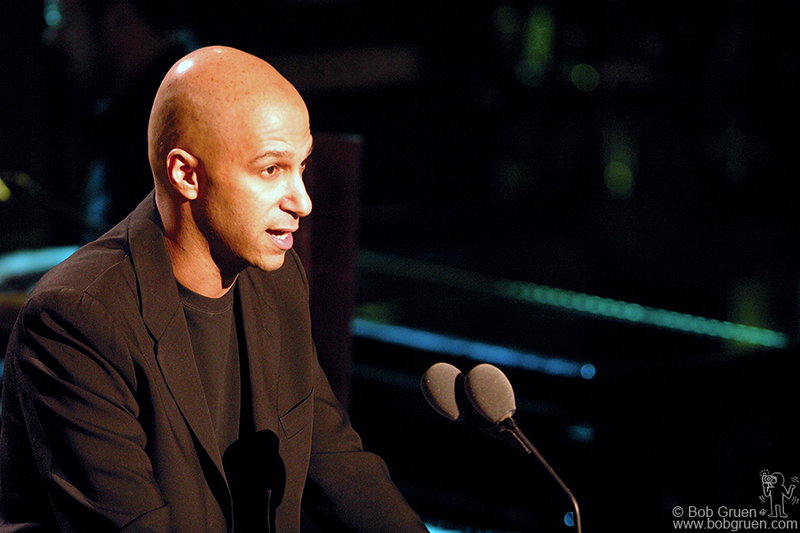 He apologised for talking politics, but added “We’re having a good time tonight, but we’re going to kill a lot of people next week so let’s not forget it”. Sir Elton John inducted Elvis Costello and The Attractions. 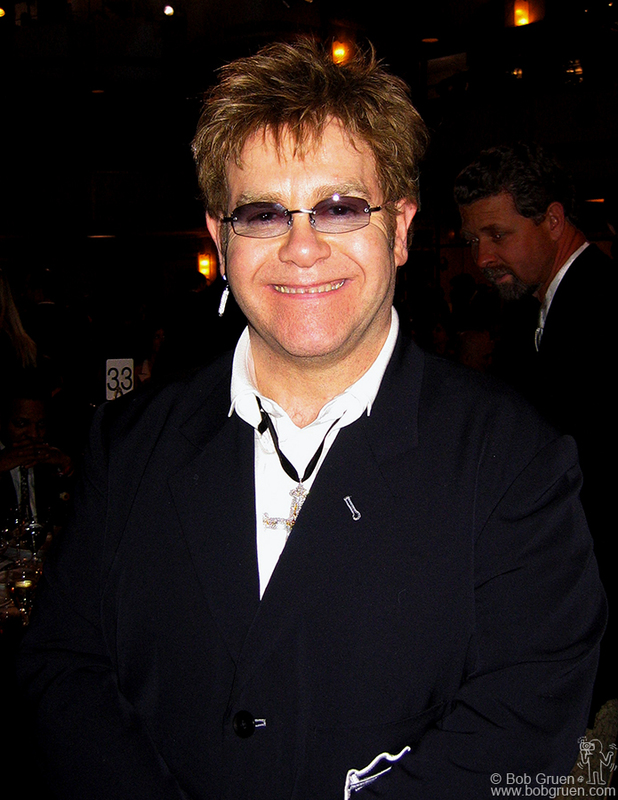 Elvis called radio “music’s mortal enemy’, and put down the “corporate raiders” who wrecked the music business. 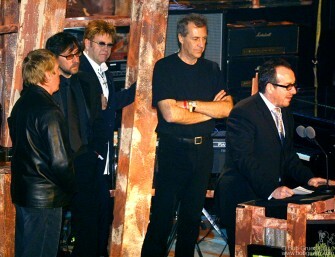 Elvis played with his current band the Imposters and sang an incendiary version of “(What’s So Funny ‘Bout) Peace, Love and Understanding”. The Edge spoke of how inspiring the Clash were to him saying there would have been no U2 without the Clash. 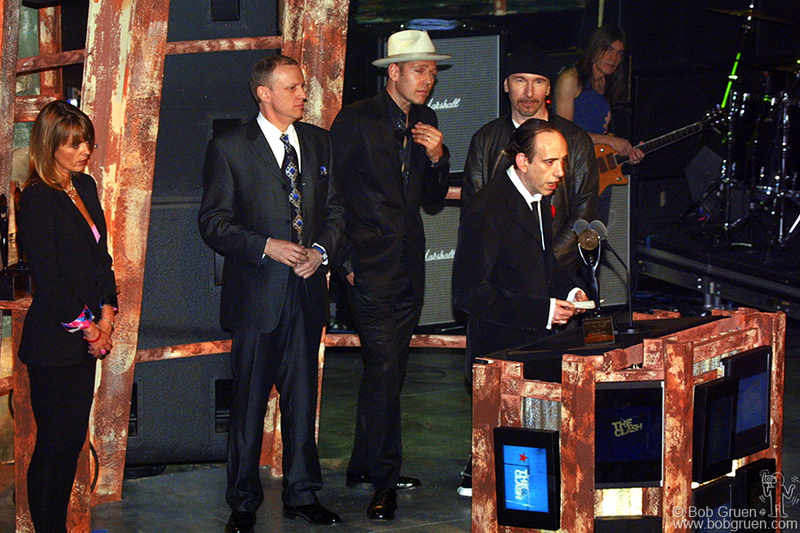 Joe Strummer’s wife Lucinda, original drummer Terry Chimes, Paul Simonon and Mick Jones thanked the R&R Hall of Fame and expressed how sorry they were that Joe was gone. 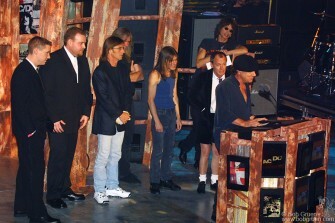 Paul described the band as “brothers in arms fighting to get our message across.” Mick said he was accepting the award on behalf of “all the garage bands that never may have dreamed of this type of moment.” They also thanked drummer Topper Headon and Manager Bernard Rhodes who couldn’t make it to New York. 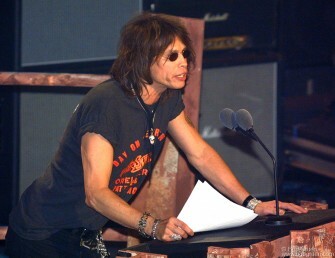 Steven Tyler gave a Rock & Roll welcome to ACDC saying “There is no greater purveyor of the power chord”. 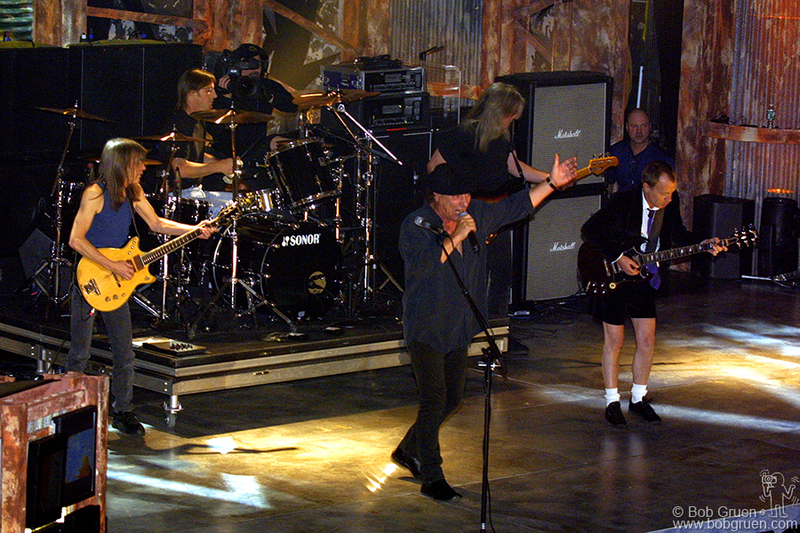 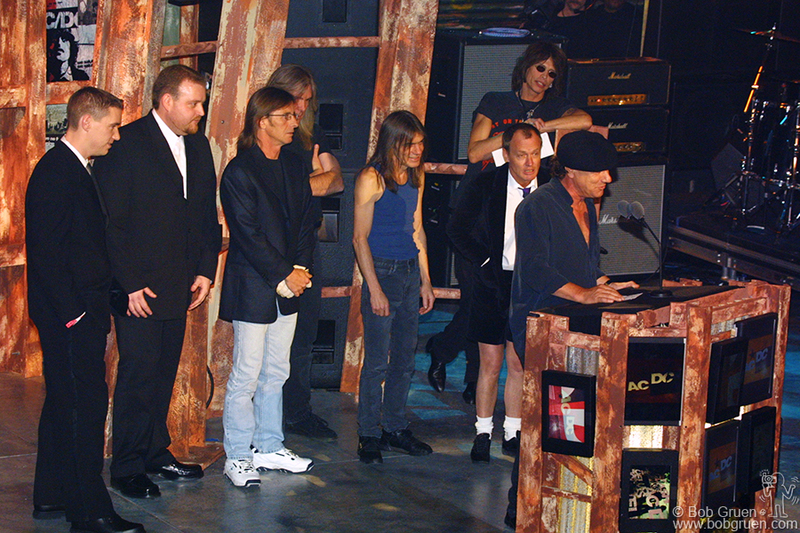 Bon Scott’s nephews accepted the award for him along with the band. 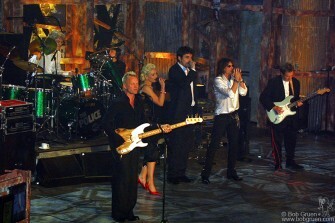 Beautiful Gwen Stefani inducted the Police into the R&R Hall of Fame. The Police played together for the first time in 18 years, and then Gwen, Steven Tyler and John Mayer joined them for an all-star finale. 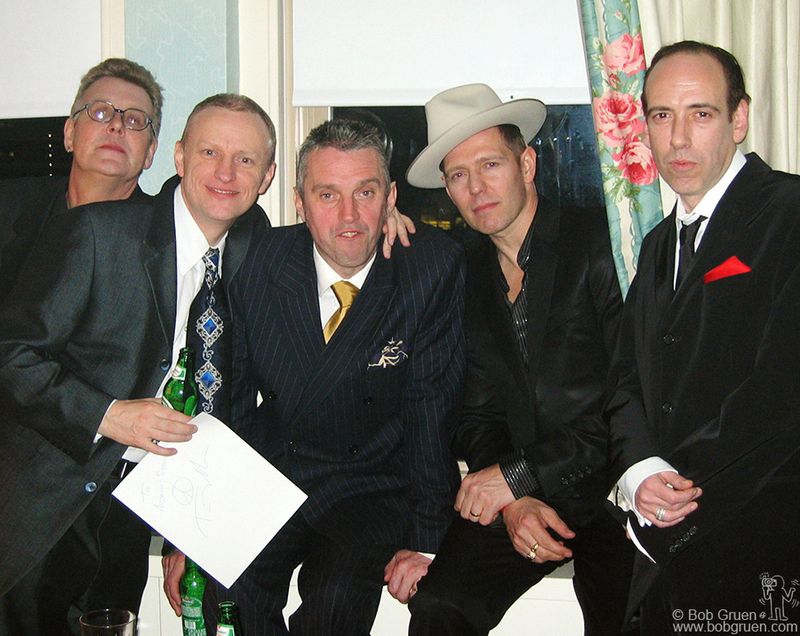 After the show, Mick Jones invited a few friends up to his room to unwind. Above are Johnny (Green) Broad, who wrote one of the best books about the Clash titled "A Riot of Our Own", drummer Terry Chimes, Clash spokesman Kozmo Vinyl, and Paul and Mick. After the show, Mick Jones invited a few friends up to his room to unwind. Above are Johnny (Green) Broad, who wrote one of the best books about the Clash titled “A Riot of Our Own”, drummer Terry Chimes, Clash spokesman Kozmo Vinyl, and Paul and Mick. Here we are at the end of a long but fun night, still smiling! 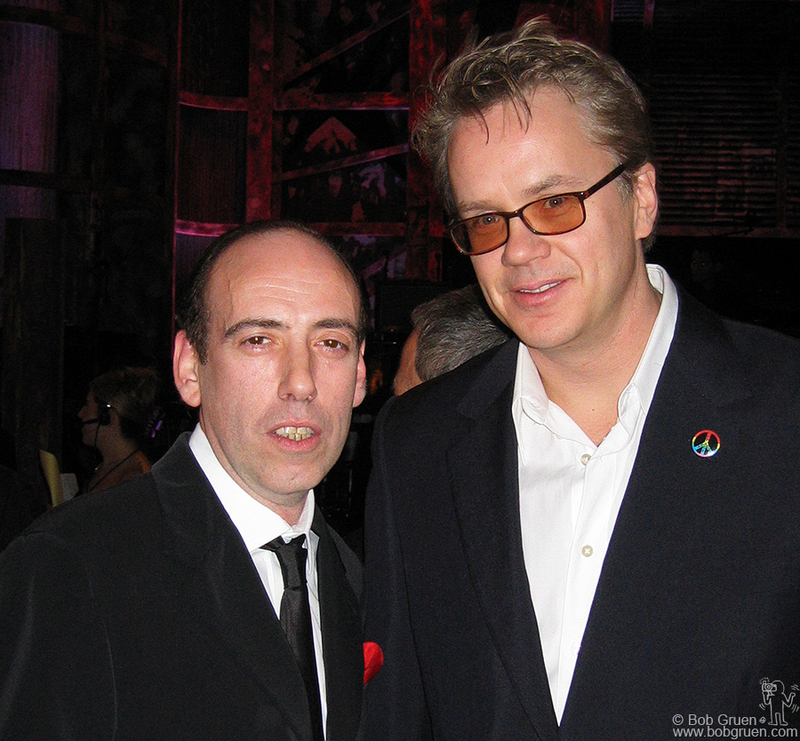 Paul, Hollywood agent Gerry Harrington and myself. Picture courtesy my wife Elizabeth.